Now in stock and available from just $999 for 25 µg! Pooled CRISPR guide RNA libraries, or gRNA libraries, are ideal for high-throughput screening of important molecular targets. These libraries leverage the efficiency and specificity of the CRISPR gene editing technology to either knock-out gene expression or transcriptionally activate genes in the genome. GenScript offers a variety of gRNA library options, all of which contain sequences pre-validated by the Broad Institute, including (1) GeCKO libraries for genome-wide knockout of human and mouse genes, (2) CRISPR Synergistic Activating Mediator (SAM) libraries for transcriptional activation of every gene in the human and mouse genome, and (3) Pathway-focused gRNA libraries that genes with a specific function. How are CRISPR libraries used? Screening using the CRISPR technology is particularly advantageous because of its simplicity, specificity and versatility. The genome-wide GeCKO and SAM libraries were designed to target every gene in the mouse or human genes and knock-out or transcriptionally activate each gene, respectively. Pathway-focused gRNA libraries were designed from targets identified through the Drug Gene Interaction Database, providing application-focused gRNA libraries for more simplified screening. Libraries are amplified, packaged and transduced into host cells to generate mutant cell lines (Figure 1). The mutants can then be screened under specific conditions, such as by positive or negative selection, to identify important genes in a pathway. The genome-scale CRISPR knock-out (GeCKO) v2 libraries enable rapid screening for loss-of-function mutations that produce a desired phenotype in human or mouse cells. GenScript is pleased to offer all eight GeCKO v2 CRISPR libraries developed in Feng Zhang's laboratory through a license with the Broad Institute. * GeCKO libraries are mixed pools of guide RNA targeting each gene and miRNA within the mouse or human genome; the improved GeCKO v2.0 libraries also contain non-targeting gRNA to serve as controls and utilize improved lentiviral vectors for high-titer lentivirus production and highly efficient transduction of primary cells. GeCKO libraries have been used in primary mouse and human cells, stem cells, cancer cells, and stable cell lines. GeCKO library screens allows you to identify genes that are essential for cell viability under different conditions, as well as genes whose loss enables drug resistance in cancer cells. For complete details of GeCKOv2 library design & construction, please see: Sanjana N.E., Shalem O., Zhang F. Improved vectors and genome-wide libraries for CRISPR screening. Nat Methods. 2014 Aug;11(8):783-4. doi: 10.1038/nmeth.3047. GeCKO v2 libraries are available as two half-libraries, A and B. Each library contains 3gRNAs per gene. Both libraries contain 1,000 non-targeting control sgRNAs. The A library contains gRNAs targeting miRNAs (4 sgRNAs per miRNA) as well. The A and B libraries can be purchased and delivered together to ensure complete representation; however, as more cells are required for both libraries, screening with library A is suggested. The gRNA libraries at GenScript are Industrial Grade and in-stock for immediate delivery (please allow 5-7 days for shipping) unless stated otherwise. Additional quantity options are available, but may require additional turnaround time. Email us for more information on additional library options. Pooled library (Industrial Grade) in 25 µg aliquots. The 100 µg and 200 µg library are delivered as 4 x 25 µg or 8 x 25 µg, respectively. The libraries are delivered with a technical guide, MSDS and COA. A cell population should be transduced with the GeCKO library pool at a low MOI ensuring no more than 1 gRNA enters any given cell. After transduction, deep sequencing with NGS should be performed to assess gRNA representation in the cell pool before beginning a screening protocol. At the end of the screen, a second round of NGS is performed, and data analysis should be performed to identify the guides that were lost or enriched over the course of the screen. In order to identify true positive hits from a GeCKO library screen, you should identify genes for which multiple guides were enriched. The SAM library enables gain-of-function screening in human cells by inducing robust, specific transcriptional activation of each coding region in the genome in a single screen. CRISPR/Cas9 Synergistic Activation Mediator (SAM) is a protein complex engineered to enable robust transcriptional activation of endogenous genes. 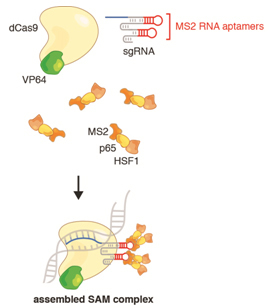 SAM takes advantage of the specificity and ease of reprogramming of Cas9 nucleases, which are targeted to a specific locus in the genome by guide RNA. The SAM complex includes three transcription activation domains VP64, P65, and HSF1 which synergistically enhance transcription when targeted to any site within 200bp upstream of a transcription start site. SAM uses a nucleolytically inactive Cas9 to ensure that no strand breaks are introduced into endogenous genome. The human genome-wide SAM library activates all known coding isoforms in the RefSeq database (23,430 isoforms) for gain-of-function screening. SAM libraries have been used in primary mouse and human cells, stem cells, cancer cells, and stable cell lines. SAM library screens allow you to identify genes that are essential for cell viability under different conditions, as well as genes whose loss enables drug resistance in cancer cells. For complete details of SAM library design & construction, please see: Konermann S*, Brigham MD*, Trevino AE, Joung J, Abudayyeh OO, Barcena C, Hsu PD, Habib N, Gootenberg JS, Nishimasu H, Nureki O & Zhang F. Genome-scale transcriptional activation by an engineered CRISPR-Cas9 complex. Nature, doi:10.1038/nature14136. 70,290 gRNA sequences; 3 sgRNA targeting each of 23,430 unique coding isoforms in the human genome. Human SAM gRNA library is cloned into pLenti sgRNA(MS2)_zeo vector backbone. Library is accompanied by the pLenti dCas-VP64_Blast and pLenti MS2-P-HSF1_Hygro plasmids which must be co-delivered. All SAM libraries are Industrial Grade and in-stock for immediate delivery (please allow 5-7 days for shipping). Additional quantity options are available, but may require additional turnaround time. Email us for more information on additional library options. Cells must be transduced with all three SAM components. To enable co-transduction and selection, all three lentiviral vectors have unique resistance markers. All three components are delivered in lentiviral vectors optimized to produce high-titer virus for efficient lentiviral transduction of primary cells or cultured cell lines. A cell population should be transduced with the SAM library pool at a low MOI ensuring no more than 1 gRNA enters any given cell. After transduction, deep sequencing with NGS should be performed to assess gRNA representation in the cell pool before beginning a screening protocol. At the end of the screen, a second round of NGS is performed, and data analysis should be performed to identify the guides that were lost or enriched over the course of the screen. In order to identify true positive hits from a SAM library screen, you should identify genes for which multiple guides were enriched. A more detailed SAM screening protocol may be found on the SAM / Genome Engineering website. The inSC17xx-1corporation of three distinct activation domains - VP64, p65 and HSF1 – into the complex aids robust transcriptional activation through synergy. Each of the three components are encoded on a separate lentiviral vector as described below. All three vectors must be co-transduced in order for SAM to be active All SAM human genome-wide guide RNA library sequences are available in this .csv file. Pathway-focused pooled gRNA libraries are ideal for targeted screening of specific pathways of importance. Designed using gene targets identified through the Drug Gene Interaction Database, these libraries are ideal for thorough screening of pathway or disease-focused genes. All gRNA sequences have been pre-designed and validated by the Broad Institute and cloned into pLentiCRISPR v2 vector backbones. All libraries are delivered Industrial Grade and ready for immediate lentiviral packaging. For more information on the gRNA sequences covered in the library, click on the library hyperlink. The pathway-focused libraries are available as Industrial Grade, and available for next-day shipping (depending on availability). In addition to the in-stock libraries above, the following pathway-focused libraries are also available. Please allow 3-4 weeks for delivery. Click on the hyperlink to see the full gene list. *Starting price for 25 μg pooled library. 100 μg quantity available upon request. Libraries are provided in 25 µg aliquots. Guide RNA sequences are cloned into pLentiCRISPR v2 vectors and delivered as Industrial Grade. All libraries will be delivered with a technical guide, MSDS and COA.